Manuals for this experiment can be found here. 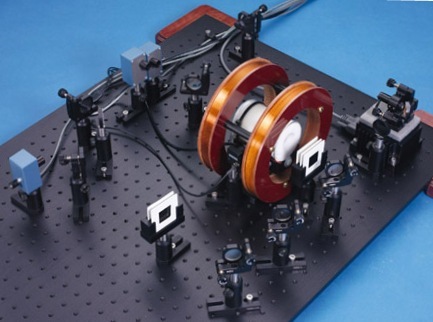 Apparatus set up for simultaneously doing saturated absorption spectroscopy and using an unequal arm Michaelson to calibrate the laser frequency sweep. Left: Doppler broadened absorption lines. Right: SAS absorption lines within Doppler curve. Control Box for these experiments. Tuning to 795nm: With a cold diode, the laser can be tuned to the 795 nm S1/2 - P1/2 rubidium transition. The simple spin states of this transition make observing the Zeeman levels less complicated.